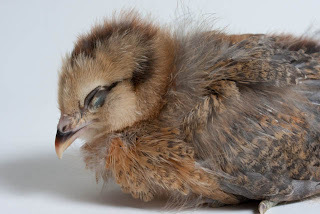 My husband Mars and I have begun obsessively photo-documenting our chickens. We did the same thing when our son was born. While I think most people do this with their children, at least with their firstborn, the rigor and discipline with which Mars has cataloged our son's growth and adventures is astonishing. Seven years later, about a dozen new photos of Xavier go up on our Web site every single month, without fail. That's commitment, bless his heart. One of the favorite features of our family's photo Web site is the "growth" section that shows Xavier next to or holding a sock monkey, from infancy up. Having the same object in all the photos to show scale visually underlines the physical changes. 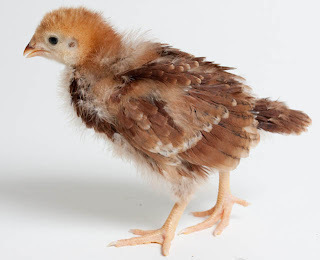 I thought it could be good to do the same with the chicks. 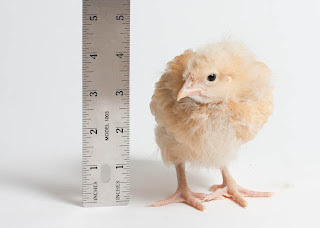 The problem is that chickens have jack-in-the box bodies, so measuring them won't be an exact science. 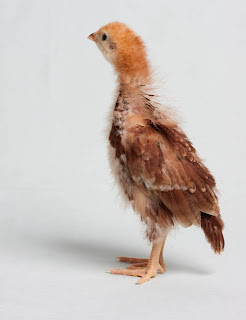 One moment a chick's neck is hunkered against her body, and the next it's stretching toward the sky. so it's hard to assign an exact height. 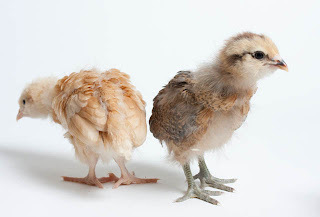 While Tilda, our Rhode Island Red above, is hard to catch in a photo because she tears all over the place and runs off the photo set, our Buff Orpington named Honey is a little camera shy. She often rolls herself into a tight ball and won't stand up. Honey sometimes needs a cuddle and some warmth while we're taking her picture. 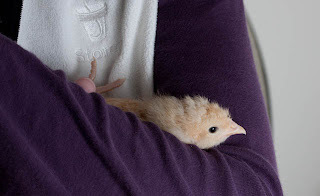 Being herded around by photo-hungry humans can be hard work, and the chicks let us know when they've had enough. . . .